In the heart of the city: a parking garage we use because it puts us right in the middle of many things we enjoy doing and seeing. (Close to the Mercado for fresh tortillas; our favorite bakery for rolls and pastries; three different public squares (Reforma, Plaza de la Paz, and Jardin de Union) along with the restaurants that surround them; shops and cultural attractions.) Interestingly, the mural in the pedestrian lobby is very like a jigsaw puzzle the family worked on over the recent December holiday. Our sightseeing targets: the Legislative Museum and the Rul de Valenciana Mansion. 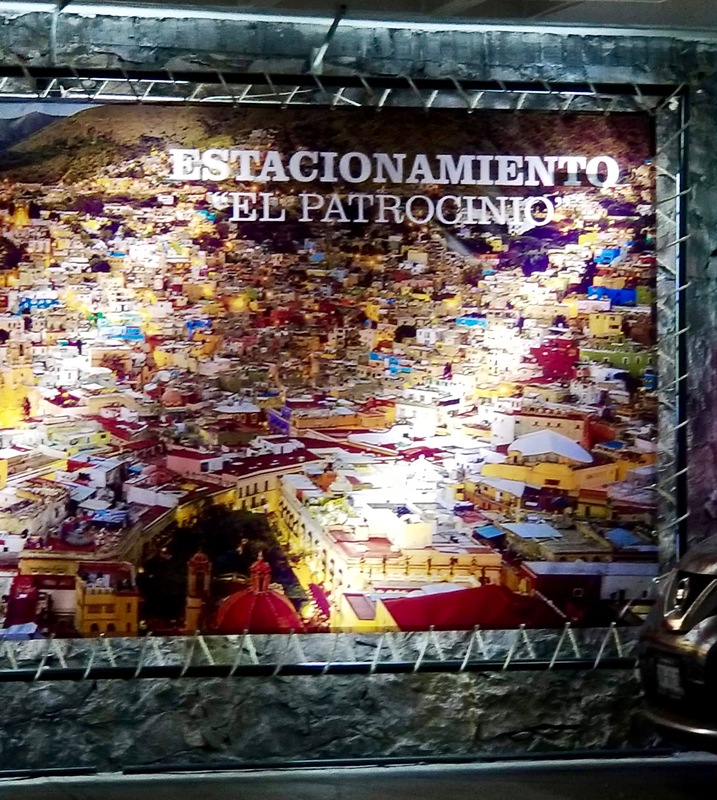 We have admired these buildings, adjacent to Plaza de la Pax/Peace Plaza, each time we strolled through; but this is the first time we have been in Guanajuato when there were public exhibitions. Lucky timing… Oh – those $25 pesos = $1.25US. Quite the deal. First stop was the Legislative Palace with its historical displays commemorating the birth of the republic and the role of Ignacio Allende. A plaque inside the door honors the English architect: C. Louis Long. The building was officially opened by Porfirio Diaz in 1903. Diaz was one of the leaders of the Mexican Revolution and served seven terms as President. And while the displays are very interesting it is, indeed, the architectural style (neo-classic and art nouveau) that really captures my attention. Central stairway with its tile mosaics. Detail of the column topper I am smitten with. Metal panels that appear on columns and on walls. The beauty of the flow: stairway, hall, and balustrade. One of many hand painted, highly-detailed and gilded wall panels. Close up of the rostrum and lecterns. It has overtones of a church interior. And those chandeliers!! Furniture detail from a bookcase in the Legislative Library. Putting myself into the picture in one of the conference rooms. Next stop was the Rul Mansion. This is the original residence of Don Antonio de Obregon, Count of Valenciana, erected with the wealth obtained after thirty years of uninterrupted excavation of his silver mine. The house sign (above) notes that Alexander von Humboldt, a German geographer, naturalist, and explorer resided in the mansion in 1803 while he was studying and writing about the mining industry. His contributions to the understanding of mining infrastructure and culture are still recognized with conferences held at the University of Guanajuato. Following his time in Mexico Humboldt traveled to America to consult with Thomas Jefferson on the newly acquired Louisiana Purchase – supplying Jefferson with information on the population, agriculture, trade, and military of “New Spain” and helping verify the southwestern border of the new territory. Jefferson would later refer to Humboldt as “the most scientific man of the age”. How’s that for a history lesson?!? No photos were allowed inside the rooms themselves, but the interior courtyard was camera-friendly. Had to include a closer image of that beautiful face and the headdress of maize. Stairway from interior courtyard up to the art galleries. We saw fabulous installations, all done by Cuban artists: Joel Corrales Márquez, Yaumil Hernández Gil, and (my favorite) Manuel Antonio Álvarez Suazo (Lolo). After the history and art it was time for a short break before lunch. We had our Kindles, so we decided on time at Plaza Reforma. I hope someone notices the capturing of the water fountain – the gusher on top that mimics the church tower and the cascading drops of water. Just a bit of serendipity, but I’ll take it. Bob takes a reading break to do some people watching. A brief stop at Jardin de Union to admire the statue of El Pípila, the hero of the city of Guanajuato. A day of observation, reflection, contemplation. A day well spent. What a beautiful trip you are having. So much culture and history. Love it. Keep ’em coming! Thanks, Kathy. We know what a gift it is to do this sort of extensive traveling. So glad you enjoy the blog. I like imagining you reading it…that inspires me. The two of you are such good travel companions,and I know Kerry is an excellent tour host and guide. Sounds like a wonderful plan. Mexico provides many delights. Hope you are staying warm! A picture perfect day captured through your voice and perspective! Picture perfect… I love it. Nice to share our day with you. Ah, thank you for reminding me. Beauty for its own sake, eh? Absolutely. And you do have an eye – for beauty and much more.